Michael J. Ryan, A Taste for the Beautiful: The Evolution of Attraction (Princeton: Princeton University Press, 2018), 208 pp. Publisher’s description Darwin developed the theory of sexual selection to explain why the animal world abounds in stunning beauty, from the brilliant colors of butterflies and fishes to the songs of birds and frogs. He argued that animals have “a taste for the beautiful” that drives their potential mates to evolve features that make them more sexually attractive and reproductively successful. But if Darwin explained why sexual beauty evolved in animals, he struggled to understand how. In A Taste for the Beautiful, Michael Ryan, one of the world’s leading authorities on animal behavior, tells the remarkable story of how he and other scientists have taken up where Darwin left off and transformed our understanding of sexual selection, shedding new light on human behavior in the process. Drawing on cutting-edge work in neuroscience and evolutionary biology, as well as his own important studies of the tiny Túngara frog deep in the jungles of Panama, Ryan explores the key questions: Why do animals perceive certain traits as beautiful and others not? Do animals have an inherent sexual aesthetic and, if so, where is it rooted? Ryan argues that the answers to these questions lie in the brain—particularly of females, who act as biological puppeteers, spurring the development of beautiful traits in males. This theory of how sexual beauty evolves explains its astonishing diversity and provides new insights about the degree to which our own perception of beauty resembles that of other animals. Vividly written and filled with fascinating stories, A Taste for the Beautiful will change how you think about beauty and attraction. From the publisher, there’s a book trailer and you can read chapter 1 online. Read reviews from Times Higher Education, Kirkus Reviews, Publisher’s Weekly, Ars Technica, and a Psychology Today interview with Ryan. Ryan also appeared on the PRI program Living On Earth to discuss his research and book. I await a copy of this new book from my local library, but wanted to inform folks about it. Lee Alan Dugatkin and Lyudmila Trut, How to Tame a Fox (and Build a Dog): Visionary Scientists and a Siberian Tale of Jump-Started Evolution (Chicago: University of Chicago Press, 2017), 240 pp. Publisher’s description Tucked away in Siberia, there are furry, four-legged creatures with wagging tails and floppy ears that are as docile and friendly as any lapdog. But, despite appearances, these are not dogs—they are foxes. They are the result of the most astonishing experiment in breeding ever undertaken—imagine speeding up thousands of years of evolution into a few decades. In 1959, biologists Dmitri Belyaev and Lyudmila Trut set out to do just that, by starting with a few dozen silver foxes from fox farms in the USSR and attempting to recreate the evolution of wolves into dogs in real time in order to witness the process of domestication. This is the extraordinary, untold story of this remarkable undertaking. Most accounts of the natural evolution of wolves place it over a span of about 15,000 years, but within a decade, Belyaev and Trut’s fox breeding experiments had resulted in puppy-like foxes with floppy ears, piebald spots, and curly tails. Along with these physical changes came genetic and behavioral changes, as well. The foxes were bred using selection criteria for tameness, and with each generation, they became increasingly interested in human companionship. Trut has been there the whole time, and has been the lead scientist on this work since Belyaev’s death in 1985, and with Lee Dugatkin, biologist and science writer, she tells the story of the adventure, science, politics, and love behind it all. In How to Tame a Fox, Dugatkin and Trut take us inside this path-breaking experiment in the midst of the brutal winters of Siberia to reveal how scientific history is made and continues to be made today. To date, fifty-six generations of foxes have been domesticated, and we continue to learn significant lessons from them about the genetic and behavioral evolution of domesticated animals. How to Tame a Fox offers an incredible tale of scientists at work, while also celebrating the deep attachments that have brought humans and animals together throughout time. The exhibit runs September 19, 2014 through January 3, 2016. Abstract In 1960, American parasitologist Don Eyles was unexpectedly infected with a malariaparasite isolated from a macaque. He and his supervisor, G. Robert Coatney of the National Institutes of Health, had started this series of experiments with the assumption that humans were not susceptible to “monkey malaria.” The revelation that a mosquito carrying a macaque parasite could infect a human raised a whole range of public health and biological questions. This paper follows Coatney’s team of parasitologists and their subjects: from the human to the nonhuman; from the American laboratory to the forests of Malaysia; and between the domains of medical research and natural history. In the course of this research, Coatney and his colleagues inverted Koch’s postulate, by which animal subjects are used to identify and understand human parasites. In contrast, Coatney’s experimental protocol used human subjects to identify and understand monkey parasites. In so doing, the team repeatedly followed malaria parasites across the purported boundary separating monkeys and humans, a practical experience that created a sense of biological symmetry between these separate species. Ultimately, this led Coatney and his colleagues make evolutionary inferences, concluding “that monkeys and man are more closely related than some of us wish to admit.” In following monkeys, men, and malaria across biological, geographical, and disciplinary boundaries, this paper offers a new historical narrative, demonstrating that the pursuit of public health agendas can fuel the expansion of evolutionary knowledge. 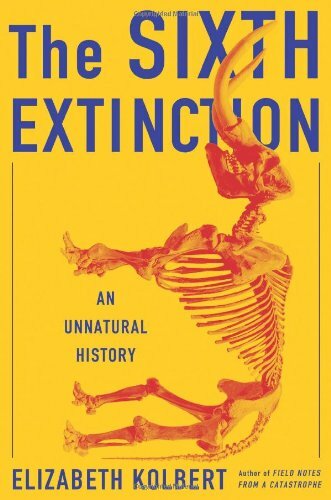 Elizabeth Kolbert, The Sixth Extinction: An Unnatural History (New York : Henry Holt and Co, 2014), 336 pp. Kolbert has done any radio interviews and podcasts about her new book, including for NPR, Slate, New Books in Environmental Studies, and the American Museum of Natural History.